George Bush | Squackle.com! The Funniest Site on the Net! Who was president during the Nixon administration? Q: Why did all the faggots vote for Clinton? A: Because faggots like assholes better than Bush. Q: How will everyone remember Bill Clinton in history? In case you forogt, this is the “Group of 8” Meetings that happened a while ago. Anyway. onto the G8 Summit…These are random things that could have happened during the meetings…. 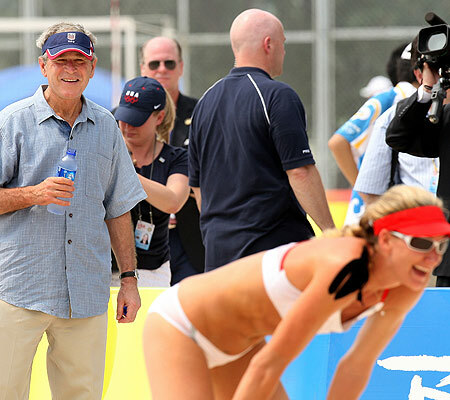 Bush, Jr.: ::nudges the President of France next to him:: hey, sugar….wanna come back to my place? ::Leader of Japan is talking about how Pokémon is good for the heart and soul, when…. Bush, Jr.: ah! they’re finally here! This is a simple topic, he is an idiot. After being in office for a little more than a month he already decided to bomb another country. He only does what his father wants him to do. I mean who is our president? Old George or George JR? I truly believe that Al Gore should’ve won the race for president but I suppose there is nothing we can do about it.